Pitch and Patch, our two North American Spotted Draft Horses, are the animal icons of the farm. They arrived in April, 2014, from Unity, ME. The sibling pair help us strive to emulate the ways 19th century farmers would have worked the land; Pitch and Patch pull wagons and are progressing toward skidding logs and raking local hayfields. Our draft horses work together very well and enjoy going on carriage-ride adventures around town. Downtime is spent grazing, meeting farm visitors, and watching the goings-on. North American Spotted Draft horses are a cross between the ancient Percheron (originally bred in le Perche, a district of northern France) and Belgian draft horses. Pitch, a mare, 11 years old, is 17.2 hands and weighs approximately 1,700 lbs. Patch, a gelding, 10 years old, is the larger of the two. He stands 18.0 hands and and weighs approximately 2,000 lbs. (one ton). 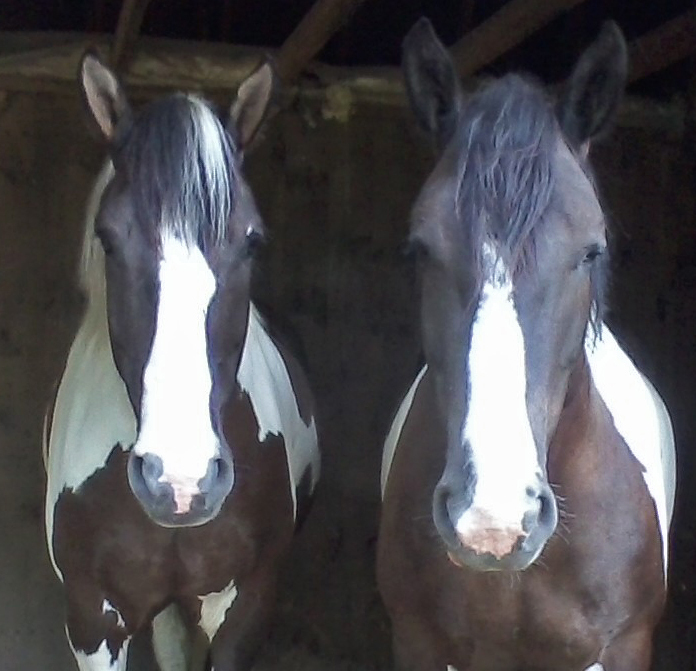 They can be differentiated from one another by the color of their manes; Pitch’s mane is mostly black, plus she has a black spot on her forehead. Patch’s mane is mostly white. Working with draft horses is both a challenging and rewarding experience. 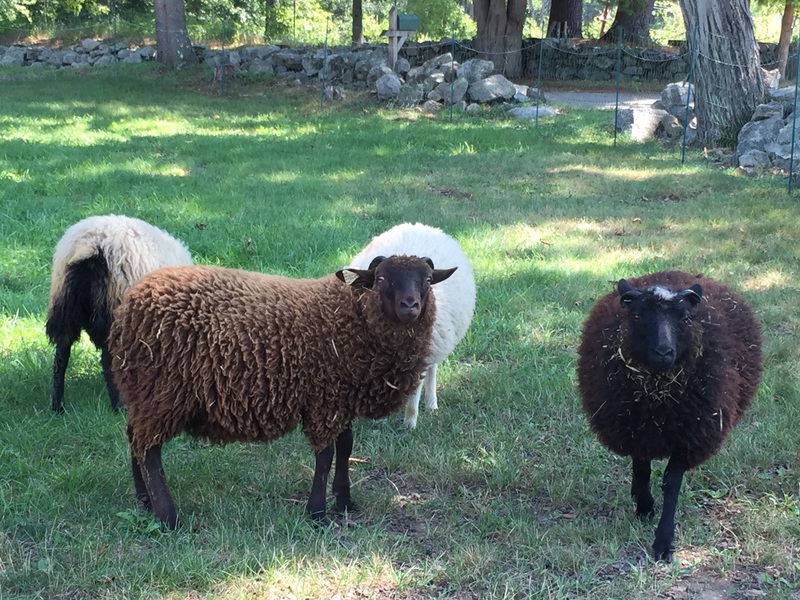 Our flock of four Shetland wethers (neutered males) are named Sean, Chip, Eli, and Franklin. They arrived at the farm in July, 2016, only three months old and just weaned from their mothers. Shetlands are an ancient breed originating in the Shetland Islands, a group of about 100 islands off the north coast of Scotland. Remains of their ancestor, the Soay sheep, have been found at Neolithic sites dating back over 4,500 years! The original Shetland sheep were left to run wild on the islands until the spring shearing. Over thousands of years, this environment created a hardy, intelligent creature quite capable of caring for itself. Our four fuzzy little boys will be sheared for the first time this spring. Shetlands produce excellent wool, from coarse outer “guard” wool to the fine, soft under-wool, comparable to merino wool. We hope to process this fleece on-site, as part of workshops that show the journey from fleece to spun yarn. The Shetlands are also an essential component of our newest children’s program, “Sheep, Frogs, Flowers and Fun!” The kids always love to greet the sheep and touch their soft fur. We have a kaleidoscopic flock of chickens made up of four heritage breeds. There are golden Buff Orpingtons, grey and brown Araucanas, black and white Plymouth Rocks, and black Australorps. 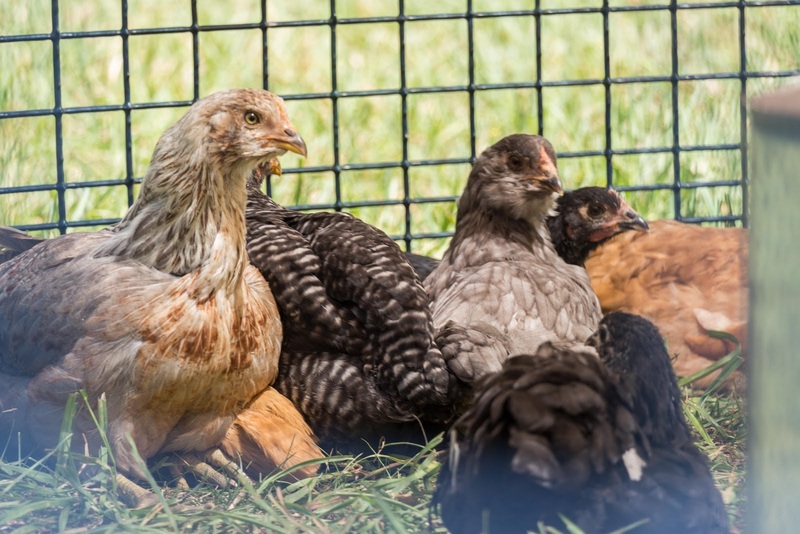 These breeds have a long history of providing large numbers of eggs for small family farms. They were bred to be well-rounded chickens that can lay eggs and benefit the farm community. Despite the various chicken breeds, our hens generally get along very well by following their established pecking order. Rosie (Rosemary), George, and Heather are our resident farm cats. All were adopted from local animal shelters. These domestic shorthairs help control the varmint population as well as provide companionship. 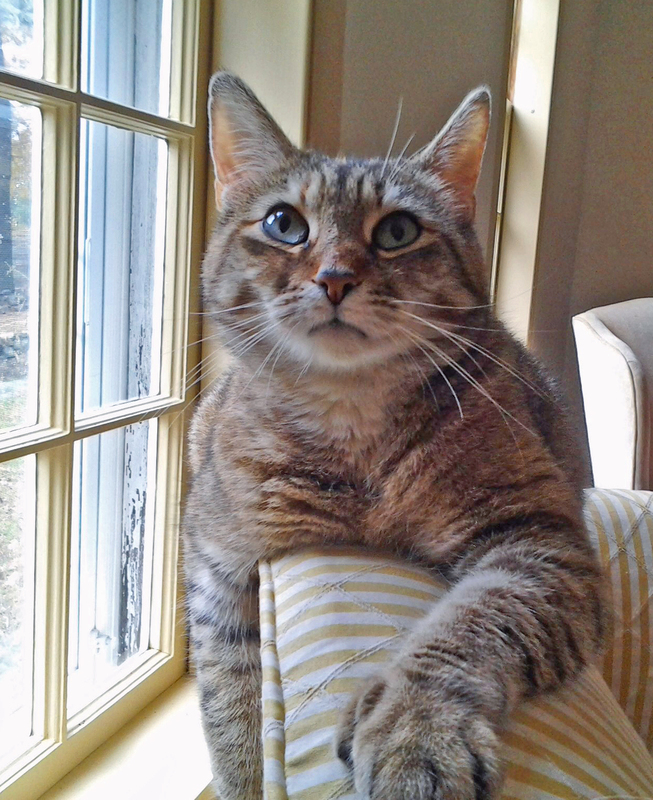 Rosie, an orange and black tortie, is an indoor cat who lives in the restored farmhouse. George and Heather have the run of the farmyard (barn, carriage house, and gardens), and all the fresh catnip they could ever want. If you come for a workshop, keep an eye out for our cats, they love to greet new people! The ifarm property covers 19 acres of riparian and woodland habitat, with many wild animals calling it home, including beaver, deer, fox, coyotes, red-tailed hawks, barred owls, and blue heron (among others). It’s a birding paradise with a large variety of habitats located around the ponds, woods, gardens, and open space. We have lots to explore! Please note that while the trails are accessible to the public, the farm has visiting rules. It is not feasible for us to run individual tours every day. Please direct questions about visiting the farm to info@ifarmboxford.com. Too cold for our human.